The day I figured out how to make sugar-free frosting I was elated. The problem I kept running into was that I couldn’t find a good sugar substitute for powdered sugar. Then, I learned how to make Italian Meringue Buttercream. IMBC uses granulated sugar, which opens the door to more sugar substitutes instead of only the powdered variety. I prefer IMBC even when I am baking a full sugar cake. It is easier to work with. It is so silky smooth that creating a smooth flawless cake is simple. Also, IMBC firms up in the fridge. Standard American Buttercream is made with all or part shortening, which is always soft. IMBC uses all butter, which makes it firm up like butter when it’s chilled. 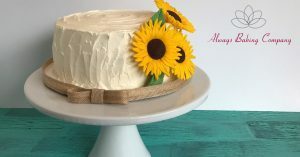 A firm cake makes it easier to layer icing and so much more! Why did Italian Meringue Buttercream open doors for sugar free frosting? My favorite sweetener is Xylitol. It is very similar to granulated sugar. It tastes closer to sugar than any other sweetener I’ve tried be it doesn’t have a funky after taste. And you can use it cup for cup. I have tried to make it into a powder with a coffee grinder, but this is extremely messy and not entirely effective. So, when I found a frosting that uses granulated sugar, I figured I could make the same thing only with Xylitol instead of sugar. And it worked! One nice thing about IMBC is that it doesn’t use a lot of sugar. Typical American Buttercream uses 8 cups of powdered (confectioners) sugar. IMBC uses only 1 1/4 cups of granulated sugar for the same amount of frosting. I simply adore sugar free IMBC. I could eat it by the spoonful (and sometimes have). But since I discovered this sugar free frosting, I have been on the search for the perfect flour free vanilla cake to go with it. So far I have come up dry. Haha, get it? The cupcakes have been dry. Ok, bad pun. In all seriousness though, I keep finding my cupcakes are dry and firm. Where’s the light and fluffy and moist cake I am looking for? For Day 11 of my 30 Day Challenge, I set out to try another cupcake and see if it can stand up to my rigorous standards. Sadly, it did not. It still produced a respectable cupcake and one I thoroughly enjoyed for my birthday. Yes, I make my own cakes for my birthday. 😊 I also froze the left overs for me to eat when I can fit into my pants again (30 days of baking is wreaking havoc on my waistline!). However, today’s cake was too dry and dense to be the perfect cupcake. But I will keep trying! And when I find that perfect cupcake I will share it with you. Until then, my quest goes on. Looking for my amazing Sugar Free Italian Meringue Buttercream recipe? I am not at liberty to share it as I received the base recipe as part of a paid Craftsy class by Erica O’Brien. Better Buttercream with Erica taught me how to make and work with this amazing frosting, producing the perfect sharp edge on my cakes. It also includes the recipe I use for IMBC. I simply replace sugar with Xylitol cup-for-cup throughout. Until 11:59pm February 12, 2017, All Craftsy courses on sale for under $20!! Check out the deal here.